Medicare Supplement Plan F has long reigned supreme as the most popular of all Medigap offerings, currently accounting for more than 50% of all Medigap enrollments. The problem is, that it will not be offered to new enrollments, starting in 2020. Call today for a FREE consultation 844-528-8688 or compare rates and company's on this page. Keep reading for details on the Medicare Supplement Plan F.
It’s no surprise that Plan F is so popular. 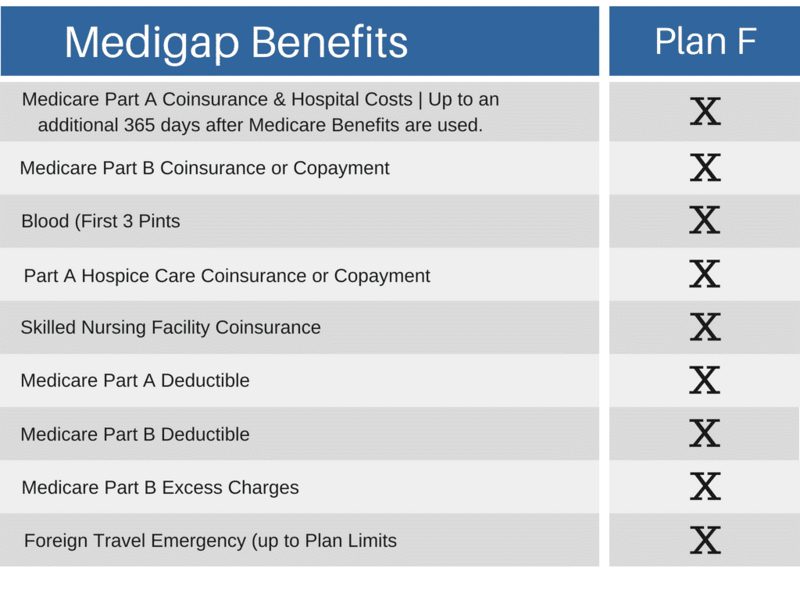 Medicare recipients opt-in to Medigap because they are looking for a way to avoid as many unexpected out-of-pocket charges as possible, and Plan F is the only option that includes every single Medigap benefit. Simply put, if you are willing to pay a very high monthly premium in exchange for almost zero extra expenses at the time of service, Medigap F is probably the plan for you. With the Medicare Supplement Plan F not being offered to new enrollments the Medicare Supplement Plan G is fast becoming the favorite. Plan F offers the most comprehensive coverage of any other plan (even rivaling Plan G). If you choose this plan, the only expenses you’ll incur on covered services are 20% of any medical care that falls under Foreign Travel Emergency coverage. Plan F is unique to any of the other Medigap plans because it includes an optional high deductible version. The High Deductible Plan F includes all of the same coverage as the regular Plan F. However, these benefits only kick in once you have met the annual deductible. Before you meet the deductible, you must pay 100% of all health care costs. While this might seem like an undesirable option, the High Deductible Plan F typically has the lowest monthly premium of all Medicare supplemental insurance plans. For 2018, the High Deductible Plan F has a deductible of $2,240. Who Is Medicare Supplement Plan F Best For? The standard Medigap F is ideal for anyone looking to almost never receive a bill for medical expenses. While your monthly premium will be very high, your monthly healthcare budget will be as predictable as it can possibly be. People who like to know exactly what they are paying for healthcare, and those who don’t want to deal with the hassle of setting aside money for unexpected charges, are ideal candidates for Plan F.
Considering Medicare Supplement Plan F? There’s a reason that Plan F is so popular. However it’s also important to realize that starting in 2020, it will no longer be open to new enrollees. So, if you are thinking about getting Medigap F, whether the standard option or the high deductible plan, now is the time to enroll. If you are ready to get started, or if you just aren’t sure what’s the right plan for you, let us help you every step of the way. Give us a call at 844-528-8688 or use our contact form to reach out today.